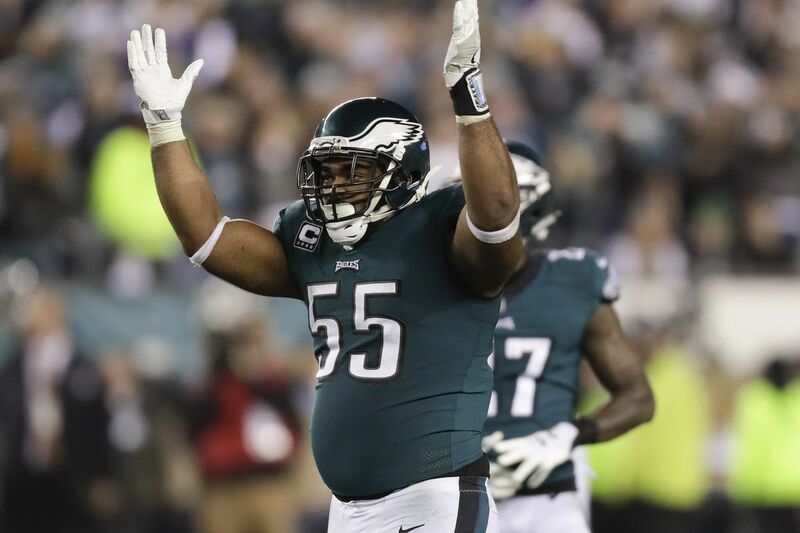 Vegas Vic has made some serious green picking Brandon Graham and the Eagles to win outright this postseason. He’s not about to stop now. Vegas Vic, our oddsmaker out in Sin City, breaks down Sunday's Eagles-Patriots game and adds his observations on some of the prop bets. Vegas Vic's take: Gambling. To some it's a religion, and if you ask Mrs. Vic and the little Vics, they'll tell you I have a spread bible for every sport. Gambling has kept the lights on, paid for the heat & air, and filled my pool for the last 35+ years. Gambling, depending on the Supreme Court decision coming this spring, could soon be LEGAL EVERYWHERE. Not just my adopted hometown of Vegas. >>SUPER SUNDAY: Our Super Bowl coverage from Minneapolis and Philadelphia will begin at 7 a.m. Sunday. Before we get to the pick, gotta tell you about a friend that just sent me an email. He bought two tickets for the Super Bowl last year. Fancy, schmancy box seats for $3,500 per ticket. Whaddya get for 3 1/2 dimes? A ride to and from the airport, lunch, dinner, a $400 bar tab. When he scored the tickets, he didn't realize that it's on the same day as his wedding. So, if you are interested, he is looking for someone to take his place. NOT at the Super Bowl, at the FREAKIN' WEDDING! The wedding is at St. Paul's Church 3 p.m. Her name is Ashley. She's a good cook, loves to fish and hunt. She'll be the one in the white dress! On to bizness. There have been millions of words, spoken and written over the last two weeks, telling you who is gonna win, why they're gonna win, and how they're gonna win. So, as one of the few who called outright wins in both of the Eagles playoff games, I'm adding a few more words. Jay Ajayi and his mates in the Eagles’ backfield will be key to keeping the Patriots off the field. It's no secret that the way to beat New England is keep the ball out of Tom Brady's stitched up hand. And Captain Obvious here, me, will say a strong running attack is the key. After doing the requisite research, found out the Eagles rank 17th in rushing efficiency on the year, but first, yeah FIRST, in Explosive Rush Rate. Never heard of it? It's simply the rate of rushes that go 10+ yards. Thank you Jay Ajayi. And he'll most definitely see a bunch of action against the Patriots 30th-ranked run defense (ranked in terms of efficiency). And naturally, you need a stellar game from the QB position. And Nick "Shaggy" Foles has been remarkable. What does remarkable look like? How about completing 26 of 33 for 352 yards, three touchdowns, and 10 of 11 on third-down against a formidable Minnesota defense. And if the Pats try pressure, bring it on baby. Foles' passer rating while under pressure was 152.1. If you missed the vital spread stats, here you go. The Birds overall spread record is 12-6, 4-2 as an underdog and 5-3 on the road. They have gone over the projected total nine times and under nine times. The Patriots overall spread record is 12-6, 12-6 as a favorite and 6-2 on the road. They have gone over the projected total eight times and under 10 times. If the Patriots lose on Sunday, Boston Cardinal Seán P. O'Malley says he'll give $100 bones to Saint John's Hospice, a homeless services organization in Philadelphia. If the Eagles lose, Archbishop Charles J. Chaput will donate a hundy to Catholic Charities Boston, a social services agency in Massachusetts. Not sure if my column has been blessed, but I'm picking the Birds plus the points, keeping it light and rooting like CRAZY! Final score, good guys 23, bad guys 21. Playoffs Best Bets Overall Pct. You ready for some crazy, or, as we call ’em out here in Vegas, cross-sport prop wagers. Over the last few years, these props have been fun to look at, fun to talk about, but as always, WAY MORE fun to make money. It just takes some deep digging. Naturally, we got you covered. *Looking at the prop with Tom Brady's total completions vs. Kevin Durant's total points against the Nuggets on Saturday at Denver. Brady's over/under total in completions is sitting at 26.5. Durant's season scoring average is 25.8. Here's some Brady research. He has averaged 24.8 completions in the post-season, and it ticks up to 29.8 in the Super Bowl. However, that number is a little skewed because he had 43 connects last year when the game went into OT. Looked at Durant's last five visits to Denver, and he scored 30, 26, 25, 18 and 25. That's an average of 24.8 ppg the last three seasons in the Mile High city. Now, we just have to figure out if Philly's D can hold the Brady Bunch. *Let's move to Rob Gronkowski's total receptions, listed at 5.5, vs. Phil Mickelson birdies in the last round of the Waste Management Phoenix Open. Of course, the first question is, will Gronk play? He's now listed as probable and NO doubt he'll be on the field. Looking at his last three years in the playoffs, he had 16 receptions in 2015, 15 in 2016, missed 2017, and has 7 in this run. In the divisional game, he had 6 grabs, then only one in the AFC title game before getting knocked silly. So he averages like 5+ per game. Then we looked at Phil's tournament last week, and he rolled 5 birds in each of the first two rounds, 2 in the 3rd round and 3 in the 4th. Dug a little deeper and looked at last year's Phoenix tourney, and the birdies chirped 3 times in the first round, 5 in the second, 7 in the third and 6 in the 4th and final round. Phil once shot a 60 on the same course a few years ago. *Maybe one of my favorite props, and, a prop that might be a solid wager is, total points scored by the winning Super Bowl team -$110 vs. total USA medals at the Winter Olympics in South Korea -$110. As usual, we were deep into the rabbit hole and did some serious Olympic research. The USA brought home 28 total medals (gold, silver, bronze) from Sochi back in 2014. The Russians picked up 33 at home. So, because of the doping issues, the Russians (under a neutral flag) are sending only 169 athletes to PyeongChang, as opposed to 232 that competed in Sochi. With 69 less athletes, common sense says that the Russians are due for less medals. Should be a boost to our total. Thinking we grab maybe 6 or 8 more medals without the full Russian contingent, which put the Stars & Stripes in the mid-30s. Don't believe that the winning Super Bowl team is gonna go mid to high 30s like last year when the Patriots (34 points) sliced through the Falcons Swiss-cheese defense in the second half. If you like props, THIS is your spot baby! Mikaela Shiffrin is favored to win a couple of medals at the upcoming Olympics, which would be just fine with Vegas Vic.